You know modding FIFA since Frostbite engine rules the game has not been easy. With every FIFA update, most of the mods not only need to be reinstalled but also redone. Imagine if you need to import everything back, from badges to kits, every time FIFA gets an update. For big mods like ModdingWay one for FIFA 16 or 14, it would be insane. That´s why we believe creating big mods for 17 or 18 was not reasonable and it would demand too much time just to reimport stuff. Unfortunately this year we won´t have the chance to enjoy CG File Explorer. Changes in FIFA 19 prevented Shawminator from continuing with his project this year. 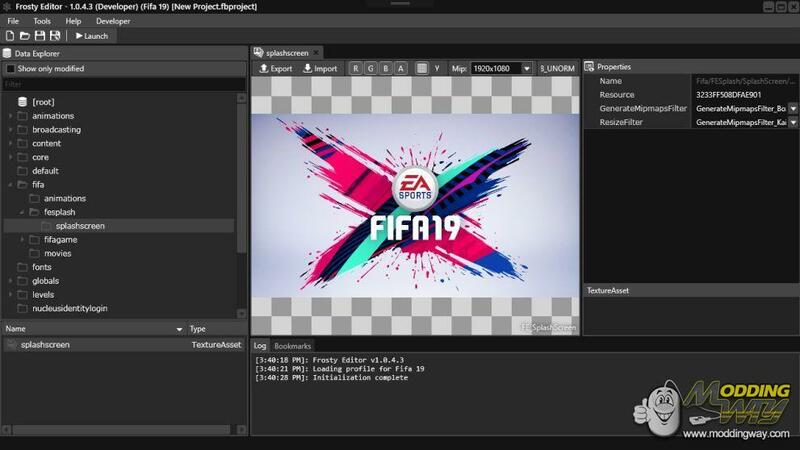 So we should not expect the tool for FIFA 19. Anyway, Galaxyman is back trying to bring us a tool to mod the game. As you see in the screenshot, the first steps have been made. But you have to be patient. It won´t be easy. Even when Frosty Editor already mods new games like Madden 19 ( same structure than FIFA 18 ) it´s not ready yet for FIFA 19. Galaxyman said "fifa17 -> fifa18 was vastly different, fifa18 -> fifa19 even more different". Hope to have some great news when FIFA 19 is finally released. We will keep you informed.